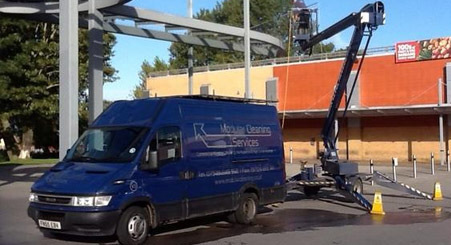 Modular Cleaning Services are a Professional Cleaning Service Provider, specialising in Commercial Window Cleaning and High Level Window Cleaning. Established in 2000, we have over 35 years combined, hands on Practical & Management Experience. Since our inception we are proudly providing Professional Cleaning Services to various businesses large and small, with notable projects comprising Office Blocks, Supermarkets, Shopping Centres & Schools..
We employ professionally trained staff who are supported by an experienced management team with over thirty five years experience in all aspects of commercial cleaning and facilities/property management. Our Philosophy is to always provide our customers with a Professional and High Quality Cleaning Service at a reasonable price. We understand security is an important issue of our customers which is why we wear uniform at all times, comply with CRB checks and have full public liability insurance. We guarantee to finish work in a timely fashion and complete any incidental tasks without question. We understand the importance of maintaining an impeccably clean and healthy work place environment, allowing our clients to remain focused on their core business.